The love for Guava our family has is immense. We can eat it just like that or dip in a mixture of salt and chilly powder or in a mixture of salt and pepper powder and eat it. The best way to eat it is to wash it thoroughly and bite it and eat the whole. And here comes some one in the family who loves to take any fruit in the form of juice rather than in the form of fruit itself. And so here it comes as Guava delight for my son to relish it. any seeds remaining, it will also be removed. Add sugar and grind again. Add remaining water and refrigerate it. Serve chilled. Before serving add ice cubes. Adding a few fresh mint leaves on top while chilling the drink, will enhance the taste. Add a pinch of salt, 2 tbsp of sugar and 1/2 tsp of pepper to the juice will enhance the taste. Guava are rich in Vitamin C. It should be taken with the skin and should be taken when half ripe. The skin and the rind near the skin are very rich in Vitamins. 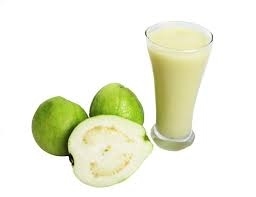 Guava juice is a best cure for Insomnia and those who are suffering from constipation can take guava juice quite regularly to regulate their bowel movement. Guava juice purifies the blood.